For too long, the training and development process has escaped the scrutiny of accountability. While expenditures have grown, many training departments have not taken the extra step to show the payoff of their efforts—particularly the more elaborate, comprehensive, and expensive programs. Tools and techniques to measure return on investment (ROI) are now available, and the process has become reliable and acceptable. Measuring the return on training investment should be a requirement in most organizations, at least for some programs. Before dismissing the idea of measuring your company’s return on training investment, consider the rewards of such an evaluation. An example of how valuable training can be is evident in the literacy training program at Magnavox Electronics Systems Company, West Coast Division, in Torrance, California. Many literacy programs are undertaken because they are needed, but little attention is paid to the program’s economic returns. Magnavox wanted to know if this type of training returned an economic dividend. After its 18week literacy program was covered verbal and math skills, it was shown to have a significant payoff for the company. The benefits of the program (reduced scrap, rework, and increased productivity) were converted to dollar values. The program yielded a cost-benefit ratio of 8.4:1 and a 741 percent return on training investment! And while these numbers are impressive, the program designers consider them conservative. ▼ Training and development budgets are continuing to grow, which creates more pressure for accountability. ▼ Training and development are linked to competitive strategies, which make them important areas for measuring program contribution. ▼ Many programs have failed to deliver what was expected; consequently, program sponsors have requested ROI calculations/ justifications. ▼ The concern for accountability in all functions in an organization is increasing; thus, the training and development function becomes one of many support efforts under scrutiny. ▼ Top executives in a large number of organizations now require ROI information. ▼ To justify their contribution, trainers have increased their interest in the ROI process. Developing ROI for training requires a key modification of a classic model. The four-level framework developed by Donald Kirkpatrick in 1959 does not focus directly on the ROI issue. 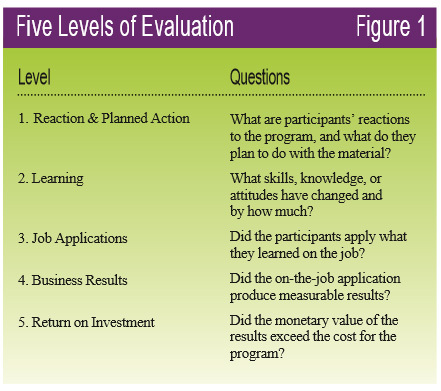 As shown in figure 1 (page 12), Kirkpatrick defines Level 4 evaluation as the results linked to training. These results could take the form of reduced absenteeism and turnover, quality improvement, productivity, or even cost reduction. But this level of evaluation does not require a specific monetary value (cost savings) to be determined. To obtain a true ROI evaluation, the monetary benefits of the program should be compared to the cost of implementation in order to value the investment. In effect, this process moves evaluation to the next level—Level 5 in our revised Kirkpatrick model. Thus, the fifth level of evaluation is developed by collecting Level 4 data, converting the data to monetary values, and comparing them to the cost of the program to represent the return on training investment. In practice, many organizations are taking evaluation to this new level for a few selected courses, often using some form of sampling. When the ROI formula is developed, evaluation is conducted at all five levels. For example, in the Magnavox case, Level 1 evaluation— reaction of employees—was measured by post- course surveys. Level 2 learning was measured by TABE (Test of Adult Basic Education) scores before and after training. At Level 3, changes in the behavior of employees were measured by daily efficiency ratings. At Level 4, business results were measured through improvements in productivity and reductions in scrap and rework. Finally, at Level 5, ROI was calculated by converting productivity and quality improvements to monetary values and comparing these to the full program costs to yield an ROI value. Calculating ROI requires a process model, as depicted in figure 2 below. The various elements of evaluation (design instruments, levels, and purposes) form the specific data collection plans. A variety of data collection tools, ranging from questionnaires and surveys to monitoring on-the-job performance, are available to trainers. ▼ calculations/estimations of the impact of other factors. This model also recognizes that there should be intangible benefits that will be presented along with the ROI calculation. Set targets for each evaluation level. Recognize the complexity of the evaluation levels described earlier. Some organizations attempt to manage the process by setting targets for each level. A target is the percentage of training programs measured at that level. For example, at Level 4, where it is difficult to measure, organizations have a low level of activity—usually less than 20 percent. Level 5 evaluation—ROI—is even less likely to occur—usually around five percent, reflecting the complexity of a process that commands significant resources and budgets. The process of establishing evaluation targets has two important advantages. First, it provides measurable objectives for the training staff to clearly measure progress for all programs or any segment of the process. Second, adopting targets focuses more attention on the accountability process, communicating a strong message to the training staff about the commitment to measurement and evaluation. Evaluate at the micro level. Training measurement and evaluation usually focuses on an individual program or a few tightly integrated courses. The ROI process is more effective when assessing the direct payoff of an individual program. Attempting to evaluate a group of courses conducted over long periods of time is quite difficult. The cause and effect relationship becomes more confusing and complex. Also, it is inappropriate to attempt to evaluate an entire function such as quality training or technical training. For this reason, evaluation must be a micro-level activity. Use sampling for ROI calculations. ▼ organization’s commitment to measurement and evaluation. Other variables specific to the organization may enter the process. Most organizations settle on evaluating one or two sessions of their most popular programs. For example, the federal government’s Office of Personnel Management has developed an ROI calculation for one of its most popular courses—Introduction to Supervision. Still others may select a program from each of their major training segments. In a large bank with six training academies, a program is selected from each academy, each year, for an ROI calculation. as part of the ROI learning curve. In the final analysis, the selection of programs for ROI calculations should yield a level of sampling where top management is comfortable in its assessment of the training and development function. Editor’s Note: The Magnavox case is just one of 18 cases reported in Measuring Return on Investment, recently published by the American Society for Training and Development as volume one of its In Action series.